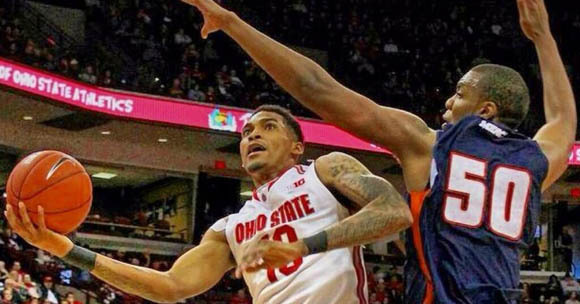 Thad Matta's basketball Buckeyes tipped off the 2013-14 slate with an 89-50 drubbing of Morgan State this afternoon in the Schott. Lenzelle Smith Jr. lead five Buckeyes in double figures with 18 on a blistering 7/11 from the floor including 4/6 from distance to go along with nine boards. Shannon Scott also had a big day with 16 points buoyed by 4/7 from beyond the arc while adding seven assists and four rebounds. LaQuinton Ross and Sam Thompson each chipped in 14 and freshman Marc Loving added 10 with five boards in his first collegiate game. Ohio State took a quick 11-2 lead thanks to three uncharacteristic triples from Scott and the Bears actually weathered the storm until the about the seven minute mark as they trailed just 26-16. From there, however, the Buckeyes closed the half on a 23-7 blitz to take a 49-23 lead into the locker room. Smith Jr. paced the run with three triples of his own plus a flush off a Scott steal and Ross capped it with his only field goal of the half, a tip-in, in the closing seconds though he did pull down nine rips. As usual, the Buckeye defense was a constant, holding the Bears to 31% from the floor while forcing 12 turnovers. The only blemish defensively came as Ohio State yielded 12 offensive caroms but I supposed that can happen when a team misses 45 shots including 15 from beyond the arc (3/18). Scott and Aaron Craft again started in the back court and while the pair was exceptional in disrupting the opposing guards and in dishing out 13 assists, they also combined for six turnovers. Thompson, coming off the bench this year, still logged 22 minutes and looked polished hitting 6/9 with a handful of those coming off uncontested alley-oops. I continue to believe Marc Loving is a guy to watch as the 2nd guy off the bench, ahead of Amedeo Della Valle. Loving played four less minutes than ADV in his debut (20-16) but still reached double figures on 3/7 from the floor and 4/5 from the stripe. Loving is clearly a more versatile and athletic player than Della Valle and today he was outstanding on the glass pulling down five total, including four at the offensive end. No hate on ADV, he just can't do as many things. He did do a nice job of not just settling for threes but he hit just 1/4 from the field for two points. Ohio State shot 48% from the floor including an impressive 11/25 from distance (44%) and owned the glass 55-34 but coughed it up 16 times. You have to love the balanced scoring but Ohio State will need Ross to assert himself a little more offensively as the season wears on. Today, he missed nine of 14 shots and I would've liked to see him try to earn a few more trips to the line knowing he didn't have his stroke locked in. That said, I loved his 11 rebounds and the fact he didn't force the issue offensively. Next up for the Buckeyes is a visit from the Ohio Bobcats. BTN has the 8pm tip-off, so no more of that BTDN subscription crap will be necessary.